When I travel I spend dozens of hours cooped up in an airplane. As the altitude increases, my feet often swell and feel uncomfortable, which can make flying an unhappy experience for me. 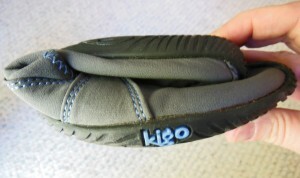 This fall I tried out Flit, the Kigo Mary Jane Barefoot Shoe while I was traveling. On the airplane this shoe feels like my feet are bare – they are perfectly comfortable. They also slip on and off easily at the security stops at the airports. This shoe is cute, eco-smart, and comfortable; I feel the shoe is a benefit while traveling in the airports. A definite win. However, if you wanted to walk a long distance, I would not recommend the shoe as it has very little support and should definitely be considered “a barefoot” style shoe. Please leave a comment below and let me know what your favorite traveling shoes are. Thanks and happy traveling! ! *Note – Because the FTC requires it, I am noting that KIGO Footwear provided a sample of their shoes for me to try out at no cost. My travel shoes are the ones I wear most of the time, because I want them to be comfy! I wear Birki’s and SoftWalks; both of which are super comfy for walking a lot. My new shoe love however, is Alegria shoes. Nice wider toe box, crazy designs and colors, and sup comfy! Nothing better than comfy shoes to make your trip smooth and happy, right?